The Collagen Induction Therapy is one of the most Hollywood’s hottest skin rejuvenation and anti-aging treatments. 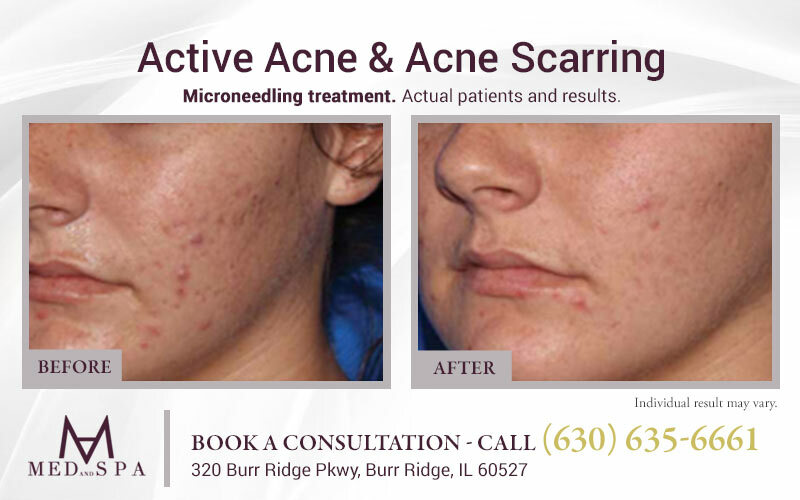 MedAndSpa in Burr Ridge near Chicago Illinois offers microneedling therapy, also known as Collagen Induction Therapy. This minimally-invasive treatment is proven to create collagen and elastin which restores the skin to its natural beauty. The Eclipse Micropen® creates precise micro-injuries in the skin that turns stimulate collagen and elastin production developing new skin cells which improve skin tone and texture. These micro injuries also create channels that allow topical product to penetrate deeper leaving the skin smoother, softer and more youthful looking. What can I expect from microneedling therapy? MedAndSpa utilizes a precise Eclipse Micropen® to treat a variety of skin conditions. This technology is designed to improve the skin in patients of all ages who want to have clearer skin with improved tone and texture. Who is the best candidate for microneedling collagen therapy? Eclipse Micropen® therapy offered by MedAndSpa in Burr Ridge Illinois improves all skin types and colors of the Fitzpatrick scale. It is proven to produce collagen and elastin; two key elements that enhance the skins radiance and beauty. When will I see results from microneedling therapy? After just one treatment, patients see an immediate “glow” to their skin. Collagen and elastin production continues over the course of several days and weeks with the majority of patients seeing lasting results for up to six months. The Eclipse Micropen® can be used to treat skin conditions all over the body including the face, neck, décolleté, arms, hands, legs, abdomen and back. Some patients only require one treatment per year to achieve the desired results. Our microneedling licensed esthetician recommend that most patients receive 2-6 treatments at 6-8 week intervals to achieve lasting results. Combine Microneedling with PRP to further enhance your beauty. We have many patients that combine microneedling with PRP therapy resulting in clearer skin with dramatically improved tone and texture. Our technical aesthetic experts will offer you a free evaluation to determine if this unique combination is right for you and your budget. Restore & beautify your complexion to reveal the New You! Contact MedAndSpa via email at info@medandspa.com or call us at (630) 635-6661 to schedule your free microneedling consultation.